229 posts in this AHO recruitment of Karnataka KPSC in Non HK region and 88 AHO posts in HK Hyderabad Karnataka Region. Candidates who qualified Degree in Horticulture Subject they are only eligible to apply online for this Group B Assistant Horticulture Officer Posts. Online applications are accepted for these KPSC Assistant Horticulture Officer vacancies from 17-12-2018 to 16-01-2019. KPSC Assistant Horticulture Officer Posts selection will be based on written examination. KPSC AHO exam syllabus will be Group B syllabus only. 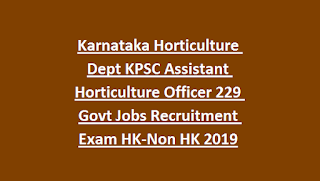 Detailed information about this KPSC Assistant Horticulture Officer Posts Exam Pattern and Syllabus, category wise vacancies, age limits, salary, AHO Selection process, KPSC AHO online application process and other details are given below. 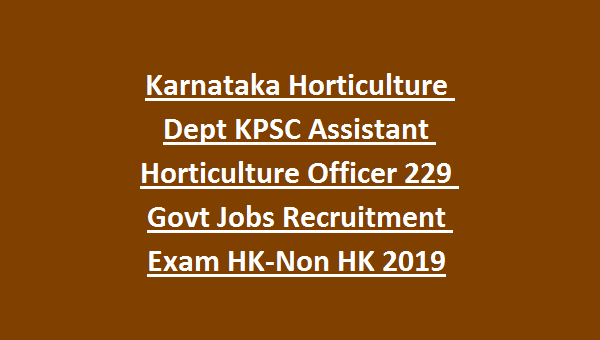 There are total 229 Sr.Asst Director, Assistant Horticulture Officer jobs in this Karnataka Horticulture Dept KPSC recruitment 2019 notification. In HK region 88 AHO posts are available in Karnataka Horticulture Dept. Age limits for AHO Posts is 18-35 years for general, 18-38 for Cat 2a/2b/3a/3b candidates and Cat1/SC/ST/ candidates age limits are 18-40 years. For both the posts candidates must have qualified Bachelors Degree in Horticulture subject of a University established by law in India. Candidates selection for this KPSC AHO jobs will be based on Written Examination and interview. Written exam will be conducted for 400 marks and consists of two papers. 0.25 negative mark for each wrong answer. Apply Online for this Karnataka KPSC AHO jobs through official website of www.kpsc.kar.nic.in. Last date to apply online is 16-01-2019. KSPC AHO Exam Syllabus and Pattern, AHO Admit Card, result and other details about this KPSC AHO Jobs will be updated in this website only.